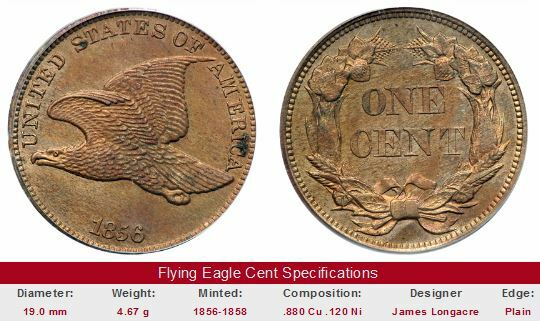 Here are the historic value trends for individual coins of the Flying Eagle Cent series. Since this coin type was minted for only three years, we are able to get the Coin Value Tables for all Flying Eagle Cents on a single page. This was the first of the small cents. Learn how this new diameter cent originated by jumping to the Flying Eagles 1856-1858 intro page. Should you wish to study trends of another US coinage type, then please use the "Get Historic US Coin Values" link in the upper right hand corner. The Coin Value Tables™ trend data for Flying Eagle cents reflect the historic availability of numeric grades to describe coins. For the 1950-1985 rows, the values in the "G-4" column correspond to the "Good" listing of those years, "VG-8" corresponds to "Very Good", and so on. The "MS-60" column records the "Uncirculated" value reported during those same decades. Similarly, "PF-65" corresponds to simple "Proof" figures. Starting in the 1990 row, coin values strictly correspond to numeric grades grades. Furthermore, "Uncirculated" grades are broken down into "MS-60", "MS-63", and "MS-65", because by 1990, this type of Uncirculated value data for Flying Eagle cents was readily available. Beginning in the 1990 row and onward, the "PF-65" figure can be precisely viewed as the value for a Proof cent ranking 65 on the 70 point scale.